1. Flash photography emphasizes pink tones, so be sure to even out skin with a yellow-toned foundation. Start around the nose and mouth where there’s redness, then blend out to the rest of the face. 2. Set concealer and foundation with sheer-finish loose powder to make them longer-lasting and to ensure that skin doesn’t shine in pictures. 3. If your dress has an open neckline, be sure to warm up your neck and chest with a dusting of bronzing powder. 4. Even if you think you won’t cry, chances are you will. Use a water-resistant eyeliner that can withstand tears. Try Bobbi Brown Long-Wear Gel Eyeliner applied with the Ultra Fine Liner Brush. If you prefer to line with shadow, make it longer-lasting by applying it with a slightly damp eyeliner brush. Finish with a water-resistant mascara like Bobbie Brown Lash Glamour. 5. After applying all your eye makeup, finish with a highlighter shade on the browbone for a bright-eyed effect. Rub your finger in a light matte shade and pat lightly on the outer corner of the browbone. 6. For a pretty flush that lasts, use two shades of blush. First, apply a neutral shade on the apples of cheeks, blending up into the hairline, then downward for a softer look. Then apply a brighter shade just on the apples of the cheeks. 7. Neutral and pale lip colors look washed out in photographs, so choose a lipstick that’s one to two shades brighter than what you normally wear. Pinks, roses and plums are great choices for brides. 8. To make sure your lip color lasts longer, line and fill in lips with a neutral lip pencil before applying your lipstick. 9. Carry a touch-up kit with concealer, pressed powder, lipstick or gloss, lip liner, tissues and mints. Also, make sure you have a mini sewing kit (for emergency clothing fixes like a dropped hem or popped button), static spray, a lint remover and prewrapped wipes to remove makeup and food stains. Be sure to read the full article here. 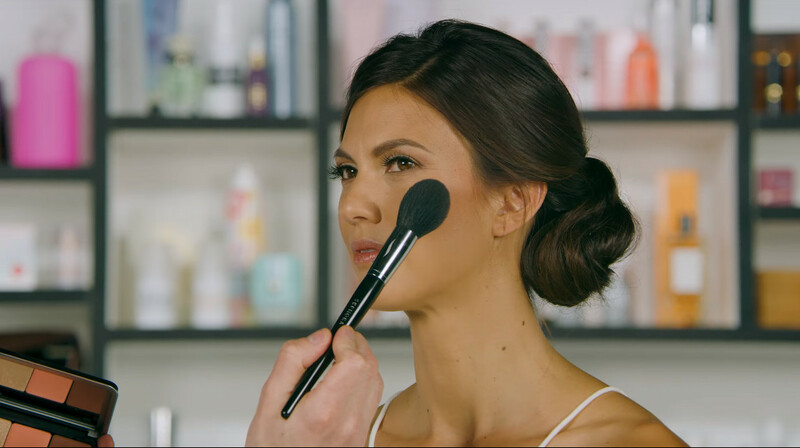 Check out Bobbi Brown Cosmetics for even more tips and to learn more about the artist’s own make-up line.